It’s January, and you know what that means. Sure, it means the holidays are over, you’re busy breaking your resolutions and cursing all the stray Christmas decorations that you missed in your haul up to the attic. But there’s something even more exciting that comes with the turn of the new year: The introduction of the new American Girl Doll of the Year 2015. Well, the wait is over. May I present to you, Grace, the French Baker. Although she looks remarkably similar to all the other little white girl with long, brown hair American girl dolls, she has an unmistakable braid AND a beret. And this year, instead of breaking child labor laws in the United States she’ll be breaking them working 70 hours a week at a bakery in Paris. (Unfiltered cigarettes sold separately). C’mon American Girl. Is that the best all your brainstorming sessions and focus groups could do? I love France and all, and heaven knows I love a good bakery, but I’m ready for you guys to shake it up a bit. Here’s a line up of my daughter’s Barbie collection. She has decided that she has outgrown her Barbies and we recently tried to get them ready to sell by matching up the Barbies with their appropriate outfits. The problem? It’s impossible, because they’re all the same damn doll. The only one that we could come close to matching up is the teacher due to her tell-tale glasses, which clearly every teacher wears along with their skin tight baby t’s and micro miniskirts. (As you can tell, we could not locate the teacher’s skirt, but this modesty box demonstrates the actual length). The reasons I bring this up, American Girl, is that although you do a lovely job of creating a fun back-story (and an ‘illegal in most states’ career) for your dolls, if you want to keep my 9 year old daughter’s attention much longer, you’re going to need a little more edge. 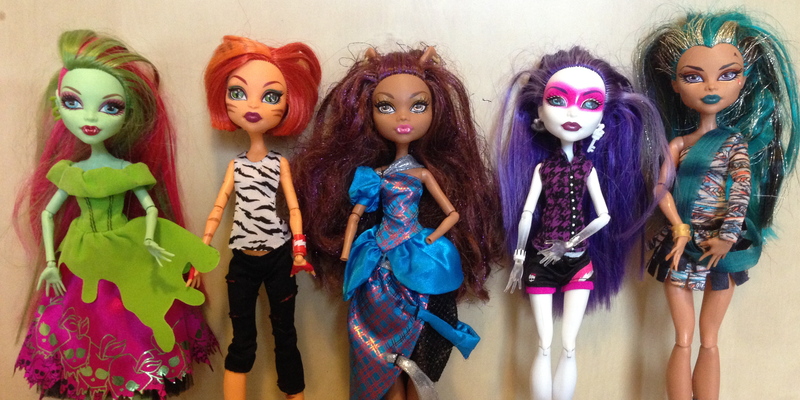 You need a doll that will appeal to the girls who are selling their Barbies so that they can buy Monster High dolls. Raven is Grace’s older sister who recently moved from Paris to New York and is currently making ends meet with a part time job tending bar at a rave club and expressing her artistic side as a tattoo artist. In her spare time she enjoys sleeping in til 1pm and blogging about her body modifications. Imagine all the merchandising opportunities! Every girl will need to purchase “Ravens Travel Set” ($44) to reenact her long journey from Paris to New York as well as both “Grace’s Tattoo Parlor” ($500) and “Grace’s Rave Bar” ($400). 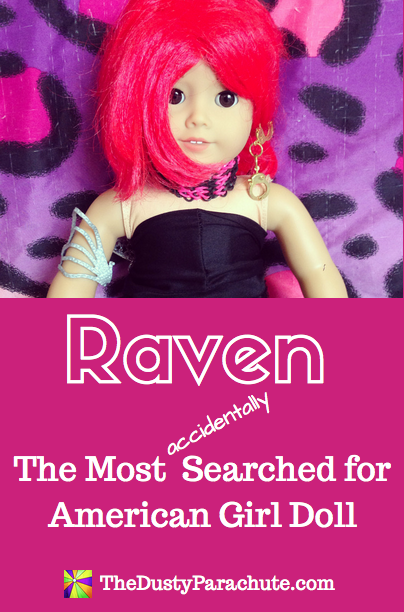 And of course, no Raven doll would be complete without her extensive set of “Raven’s Body Modification” accessories. ($32) Matching Girl & Doll earlobe stretchers, anyone? C’mon American Girl. It’s only January, if you get moving you’ll have plenty of time to scrap your brainstorming for American Girl Doll of the year 2016, Scout, and her job at an Apple Genius Bar to get moving on Raven. And please hurry. Kanani really wants to borrow a pair of Raven’s black leather pants for a party this weekend. Like our American Girl hair styling? Just wait to see what we do to LEGOs. Here’s a post about our efforts to get LEGO to offer short hair styles for Lego Friends. Nice job! I want Raven! Maybe you should work for American Doll. Love. Where were you when the did the focus groups? The bar across that Barbie doll’s snizz is priceless. I think the word ‘snizz’ is priceless and I’m totally stealing that. Good thing I got neutered, or I’d name my next kid, Snizz. “Snizz, you get in here and grab mama another bottle of Nyquel!” Raven’s wig is one that I want for my girl’s AGs. Hilarious piece! Hilarious! Loved “unfiltered cigarettes sold separately.” Made me wonder: How is there not a tattoo doll yet? Or maybe there is for all I know! Ride or Die Barbie? There was a Barbie cross-released with a japanese firm and people in the US had all sorts of bad reactions to it. I have no tattoos but I see nothing wrong with a doll for kids whose parents do. And the pink hair? cute! I thought this IMMEDIATELY. I was like, please don’t let it be another blonde one. We have the last two. (My mom buys them!) We also have others, but man, I would love to see some variety, too! Indeed. They are not tasteful at all.